The experts will tell you that babies don't like spicy foods, so pregnant women are encouraged to avoid spicy foods, breastfeeding moms are warned to avoid garlic like the plague and moms of toddlers are told to prepare spice-less versions of the food they're eating for their young 'uns. Pffft. It's clear these so-called experts haven't met our godson, 8 month-old B. Or perhaps he just didn't get the memo that he was supposed to shun all things spicy. Because when we baby-sat him earlier this week I had to stop him or he would've slurped up my entire bowl of Mesir Wat. In fact, when I made an attempt to extricate the bowl from his grubby little paws pudgy little hands, he made one last dive at the food to get more. (He was successful too - that kid'll go far) Hmmm, maybe my good taste is rubbing off on him? In which case: atta boy. Ah I love that kid. I'm submitting this bowl of Ethiopian lentils to Regional Recipes, hosted by Joanne of Eats Well With Others, because, well, the theme for July happens to be Ethiopia. That girl's really got my back, because besides being spicy and mostly good-for-you, most Ethiopian dishes are also brilliantly frugal. Which, if you are a diligent reader, you'll remember is one of my goals for the next few months. This lentil stew seems plain and (dare I say it?) boring at first sight, but as always, the added spices work their magic. 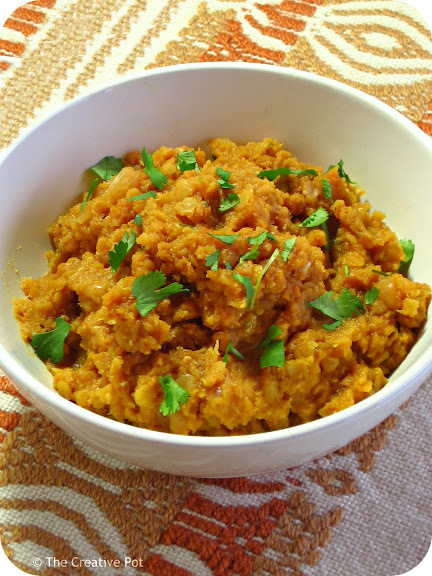 This is somewhat similar to that stalwart of Indian cooking - dhal - yet decidedly different. The flavour is more subtle and if you're a bit shy to try exotic foods, this is a perfect gateway dish. Also, if you haven't tried Ethiopian food before, I strongly encourage you to give it a go. I think you'll find yourself pleasantly surprised. 1. Heat oil in a large pot over medium-high heat, add the onions and saute until soft and glazed looking. 2. Add tomato paste, paprika, garlic, ginger, pepper and salt and fry another minute to release the fragrances, then add 1 cup water and bring to the boil, cooking for another 2 - 3 minutes. 3. Add lentils, along with rest of water, bring to the boil, then turn down heat, cover and cook for another 20 minutes or until the lentils are soft. Serve warm with injera or flatbread of your choice. Wow! That's something similar to our dhal dish, looks really good. Your nephew sounds like an adorable handful! And it also sounds like he's got a pretty sophisticated palate....I see who he takes after. 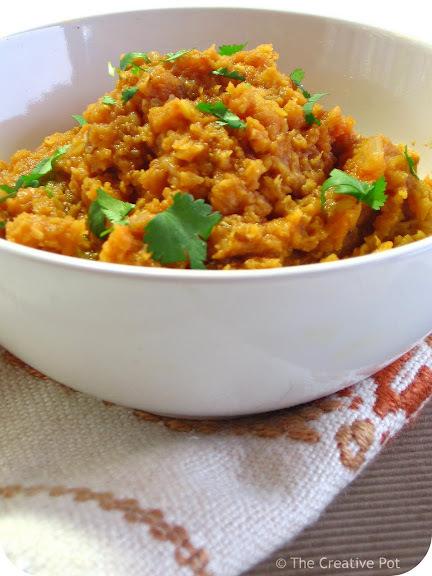 This lentil dish sounds fantastic! I've always got your back chica. Thanks for the submission! I can see why your nephew liked this. I started feeding my four year old regular food when he started solids and he hasn't looked back on the spice level either. FYI: I left a comment on your book review too. girlichef - There are so many awesome Ethiopian foods to choose from, I've already got another recipe up my sleeve which I will post about next week. Looking forward to see what you come up with! Umm Mymoonah - Quite right, this remind me a lot of dhal (which I LOVE). Joanne - Thank you for choosing such an interesting (and largely unexplored) cuisine! Watch out for my 2nd submission next week. Jaya Wagle - I think we don't give kids nearly enough credit for their tastes - after all, why would they like only bland foods? Hope you enjoy this! Would love to wrap my frozen hands around a bowl of this winter warmer!! Little Miss Linguistics - I think stock would make a wonderful addition, just be careful that it doesn't end up too salty. I'd suggest using a vegetable stock and leaving the salt out. My husband has to eat lentils at least twice a week or he gets grumpy, this dish will be a winner in his books. Dit klink so maklik om te maak! My girls like spices these days, thank goodness, Our son (the first baby) ate everything, including chicken korma baby food until he was 18 months, then went incredibly picky almost overnight. He's now the most conservative/picky eater in the family and the despair of my spicy cookingness. Luckily they are all well acclimatised to garlic and ginger, so I can go mad with those. This looks like a lovely lentil dish. I'll have to try it once we've eaten up the dhal. Mmmmmm, I so need to try this! Looks super delicious! Thanks for your nice comment and I am glad to have discovered your great blog! There are so many delicious recipes and I definitely share lots of cooking interests with you!! The pictures are beautiful!